Creating an inclusive classroom often requires we get comfortable being uncomfortable. It's comfortable to teach lesson plans as they're written. For many learners, taking this approach may prove effective. To reach learners with diagnosed or suspected special needs, we learn to embrace uncomfortability (yes, it's a real word). Uncharted or unknown territories are often opportunities for fun and growth that we enjoy only if we're intentional. Otherwise, it's just an annoying experience that you learn nothing from. Perspective matters. When I launched Jackson Education Support in 2012, the inclusive preschool classroom wasn't on my radar. Preschool games, teaching the alphabet, and early childhood education in general were not included in my list of specialty areas. I had no desire to become proficient in this area until the challenge was presented by a client. I couldn't say no. I had to give it the old college try. 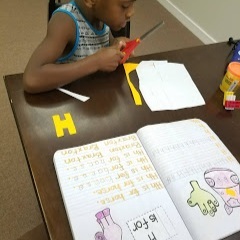 In supporting clients in early literacy growth and mastery, it was necessary to create custom early literacy activities to personalize the learning experience. The first product uploaded to Teachers Pay Teachers was downloaded nearly seven hundred times when I wrote this post and rated as an all-star resource by educators and parents. Kindergarten readiness is a big concern for parents and educators. Parents want to ensure children arrive to daycare or childcare prepared to learn, and educators want to meet the challenge of including preschool age children in meaningful learning activities - no child left behind is the goal. It seemed appropriate (and felt great) to stretch myself through professional development in order to meet the unique needs of early learners. Now, Jackson Education Support empowers and equips preK-12 and adults (with and without special needs) to transition into more challenging environments. In short, an inclusive classroom is an environment wherein students with special needs effectively learn alongside students without special needs. In order to create this kind of learning experience, we have to think critically about a number of factors (e.g., individual strengths and weak areas, achievement gaps within the group, available learning materials, curricular requirements, time management, evaluation criteria). In many instances, a team labors year-round to ensure student success. Since clients usually find me when there's a missing piece or disconnect between planning and outcomes, I've learned a great deal about curriculum adaptations. Adaptations is an umbrella term that includes accommodations and modifications. "Accommodations" refer to changes to learning environments to make curriculum more accessible, to ensure students understand content; examples include eyeglasses, hearing aids, seating students at the front of the class. I set out to improve cognitive ability, to specifically effect learning, so accommodations are usually outside the scope of services that I provide. Curriculum modifications are my strength. Modifications are the bridges that make learning possible. A modification requires both a change in curriculum and learning outcomes. This second type of adaptation helps educators and parents meet students at their level. We aren't 'dumbing down content'; instead, we're offering an age-appropriate bridge so students can participate in classroom learning experiences at a level they can understand. Modifications include substitutions, deletions, and additions to an existing curriculum. One example of a preschool age modification used to create inclusive preschool classrooms is ABC Sensory, a curriculum supplement that allows preschool educators to bridge learning in the classroom as well as strengthen home and school partnerships and homeschooling outcomes. ABC Sensory Handwriting Journal and Flashcards are designed by Jackson Education Support as early literacy tools for automating letter identification and expanding alphabetic knowledge as well as improving phonics, print concepts, vocabulary acquisition and use, and word recognition. The ABC Sensory system was created for clients and perfected over the course of dozens of private tutoring sessions with feedback from educators, students and their families. Hand signals for each letter of the alphabet improve recall and are ideal for teaching the differences between similar letters like b, d, p, and q. Preschoolers and special needs populations learn the alphabet with ease; they're also equipped to participate in an inclusive setting while growing toward mastery. ABC Sensory establishes a common system of learning the alphabet for learners with language acquisition challenges. By implementing this tool, parents and educators maintain rigor while bridging the learning gap for students with special needs. Examples follow. Olivia cries uncontrollably during carpet time letter identification activities. She sings the alphabet song along with other children, but becomes visibly emotional it's her turn to shout letter names. An effective modification involves ABC Sensory Flashcards: instead of shouting the letter names, Izzy participates with her peers by showing the hand signal for letters. Mason roughhouses with neighboring classmates after drawing on handwriting practice sheets (instead of tracing and writing the letters). An effective modification involves ABC Sensory Handwriting Journal: most handwriting practice sheets have 30% guided writing and 70% blank space for freehand writing whereas the ABC Sensory curriculum supplement takes advantage of the opposite rule (70/30) to provide much needed guidance to strengthen weaker fine-motor ability and muscle memory. With reminders to follow the guides from an adult, Mason experiences greater confidence and becomes more invested in handwriting practice. Izzy shuts downs when tasked to use a mobile device to play an ABC game that requires her to listen to letter names and choose the correct letter from several. An effective modification involves ABC Sensory and an adult: the adult shows hand signals for letter names spoken in the app as Izzy taps the correct letter on the screen. In this way, Izzy completes the same activity by leveraging her strengths. Jackson Education Support is actively seeking ABC Sensory partnerships with individuals and organizations that educate preschoolers age 3 through 5. We're offering free training with purchase for a limited time. All clients that use this system improve performance and enter the classroom with greater confidence. You're invited to become an ABC Sensory partner by contacting the learning center.